SUBSCRIBE for a new DIY video weekly! HIT THE BELL! I had many requests for a large lean to storage shed, so this is my response to that. 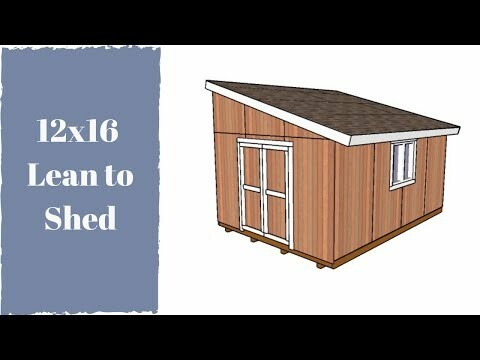 This 12×16 shed plans feature a lean to roof with a generous slope, so you can build this in almost any climate. As you can see in the video, the feature features double front doors and a side window, so you let a lot of light inside the shelter. The walls are made from 2x4s and the structure will therefore be rigid and durable. All my projects come with step by step instructions and with a complete cut list, so you can get the job done without much effort. Make sure you take a look over the rest of my plans for more building inspiration. I love the design. Looks simple and sturdy! Good presentation. Simple and useful. Thx alot for sharing sir.